When you get a bobbin case & cord and clean her up you're going to have a lot of fun sewing. I love mine! It would be nice to have a great case but for me it's not that important. You may want to check out The Featherweight Shop and see what they have for the things missing. We've all been a bit overexcited at times, try not to worry about it! I don't think you did so bad, as long as it runs, because they usually sell for around $350 in good running condition with all parts. The cases usually smell bad, it's from the glue used in making them. Sadly, the bobbin case may have been in the machine at the auction until someone stole it out of the machine. It happens. I don't own a Featherweight but I do own her big sister therefore not sure how accurate what I am about to say is. If they both use the same bobbins then you can find them at your local Joann's, also you can find a lot of items to get her running really well online. I think the website is sewing parts online (?) If not the right site surely someone will tell you the correct name. She will be a beauty when you get her all cleaned up. This discussion mentions several great online featherweight shops where you can find everything you need to get your new toy up and running. The Quilt Peddler in Fennimore WI repaired mine and replaced the pedal. Very reliable repair service. Good luck! No you didn’t. Stop worrying about it and start enjoying it! That’s not a bad price. When I bought mine I ordered a new electrically cord. A nice website is Singer featherweight. They have videos, replacement parts. Workshops around the country how to maintain the featherweight. Enjoy the featherweight. I love mine. I named mine “Edmund” because that was the name of the street we lived on. My mother had a featherweight when I was young. But I remember the oil smell. Brings back memories. Don't worry about it. If you wanted it and can afford it, you went for it and now it is yours. I paid more than that for my white featherweight and never looked back. Enjoy it! Unfortunate that they didn’t let you check it out before hand. Since featherweights can sell for $300 or $400 and higher, it’s not too bad a price. Hopefully you can get it sewing for not too much more. I have ordered the needed supplies and in the meantime I am going to set about giving her a good cleaning. I have found the Singer-Featherweight site that has a lot of good info how to safely do this. I surely didn't need another baby in my collection, but so glad she found me! I paid $350 for mine....included everything.....so if you are at $200 that is a good thing. You will be surprised at how well she will clean up. The decals look to be in pretty good shape....normally these are worn off. Have fun! I don't think you did badly on it. 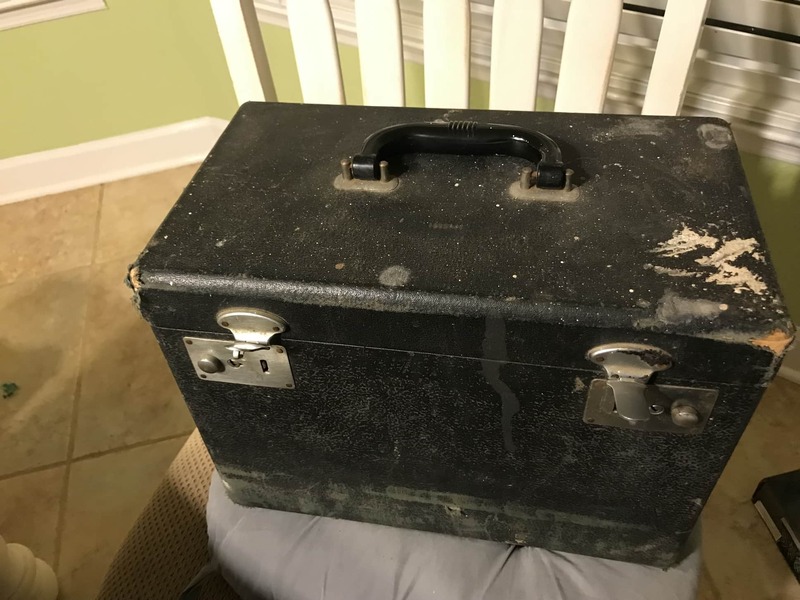 My husband paid a lot more than that for my Centennial and my case was a bit damaged. I got my white FW for a song at an estate sale, but I also took a chance because it wasn't running. I did, however, have a chance to play with it for a bit and knew that the motor ran and that it had the bobbin and bobbin case. A good cleaning and oiling works wonders. I got mine running just by doing that. If it makes you feel any better, I paid $125.00 for one at an online auction that was in terrible shape. It didn't look that bad in the photos, but it did when I picked it up. The odd thing was that I was outbid, but I woke up the next morning with an invoice and notice that I was the winner. It happens, apparently. Somewhere here on QB, Steve H posted something about touching up those dings on the edge of a black machine. He told us what product he used. If you can't find it, contact him at victoriansweatshop.com. Mine was too far gone for touch ups. It will take a re-paint. The price is well within acceptable. 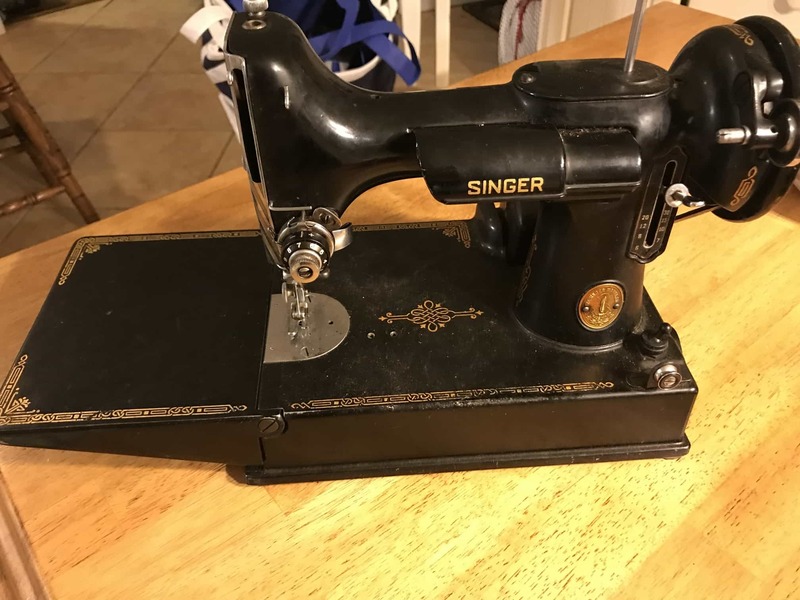 Used sewing machines always vary a lot in prices, the last decades the Featherweight has kept it's value and I guess it will in the future. Your machine looks like a bit dirty, but will clean and shine up very well. The original decals and japanning looks nice. If the case isn't particularly smelly it's a major pluss, even if it needs a bit of attention. During the clean up process you will get to know your new machine much better. Nope, you did good. The only thing I would do different when I purchased my featherweight is I wouldn't bother trying to repair the case. DH got involved and oh the trouble it caused. At that time there were nice little red nylon cases that zipped. I should have purchased that one and been happy. The older cases have a tendency to stink from the mildew or glue that the used. Lots of airing out and it still smells funny. You will always hear stories of the great buys or even free ones that have been found. But you found one that you wanted and got. You did allright. You are going to love it! Lucky you. Good choice. I paid $450 for one and $25 for another. I figure it all evens out in the end. And I love them both. I have read, no experience tho, that putting crumpled newspaper in a smelly case will remove the odor. I might even lightly spray the interior of the case with Febreeze. Let us know what worked. I don't think you overpaid. I paid $495 for my first featherweight. The Featherweightshop.com has a video on how to make that case look better and you can sometimes find reasonably priced attachments to fit your new featherweight at ShopGoodwill.com. Enjoy your new machine. They're cute and fun to sew on.